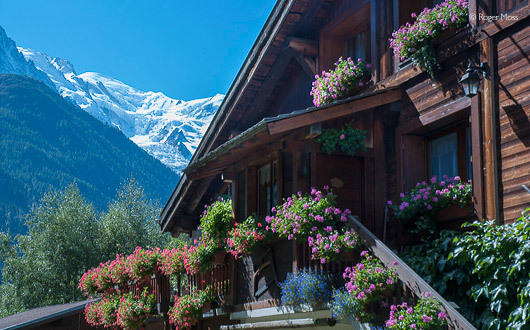 The classic Alpine chalet has become an instantly recognisable icon of mountain living, with many examples having been transformed into desirable homes and luxury leisure accommodation. However, the decorative features which are today considered so attractive have always been of secondary importance to more practical considerations. Originally these were simple mountain farmhouses in which ordinary families would live and work, either throughout the year or during the snow-free months, when cattle were moved to ever-higher altitudes to benefit from the rich, wildflower-enriched grazing which followed the snow’ gradual retreat. 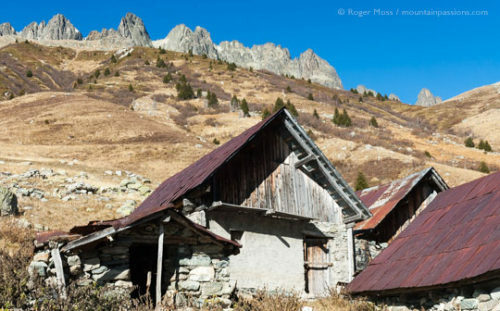 This explains why farming families often possessed a series of chalets and barns (‘granges’) sited at isolated points and successivley higher altitudes along the annual migration route from the valley floor farms to the high pastures or ‘alpages’. 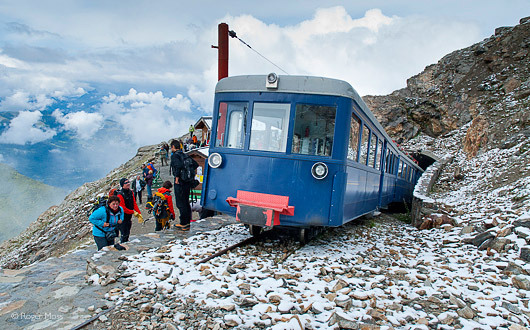 In the French Alps the seasonal migration is known as ‘la transhumance’. 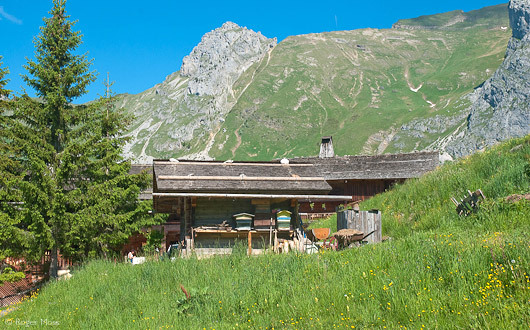 Milk from the dairy herds was (and still is) employed in the production of highly-prized hard cheeses, so the often-remote chalets were also places of work. Many of them remain so today, for artisan cheesemakers who graze their cattle on the lush summer pastures to create superlative hard cheeses identified as aplage été. Despite their instantly recognisable popular image, the buildings’ architectural styles can be seen to vary greatly from one region (or even one valley) to another in response to the availability of construction materials, which were normally sourced from nearby. 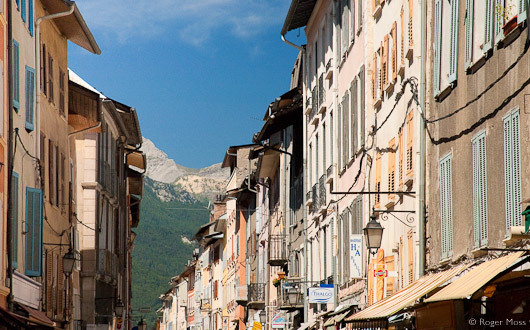 Where wood is plentiful – in the Beaufortain, Faucigny and Haut-Chablais areas of Savoie, for example – the results look very different from those which had to rely largely on stone (e.g. in the Chartreuse, Bauges, Maurienne and Tarentaise) or even, in some rarer cases, cob (‘pisé’). The apparent simplicity of mountain chalet construction can be deceptive. Each of the regional styles is founded upon centuries of experience and refinement in what are generally harsh and unforgiving environments. Beneath the superficial details, however, it’s immediately apparent just how much they have in common. The most typical approach includes a stone-built ground floor, divided into two or three areas and often partly recessed into the mountainside to afford a degree of protection from bitter prevailing winds. The presence of cattle and other livestock stabled here generated some extra warmth for the human accommodation above, while undesirable odours were carried away by the passage of air through small window openings in the stonework. This provided a solid foundation for the more visible timber upper stages, supported by a framework of massive piers and joists, frequently of seasoned spruce (or ‘épicéa’). This slow-growing timber can live for 500 years or more, and contains tannins which darken upon prolonged contact with the atmosphere, eventually allowing the chalet to blend harmoniously into its natural surroundings. This process is obviously much less likely to happen when less durable timbers used in modern construction, since they require protection against decay by applied chemical finishes. 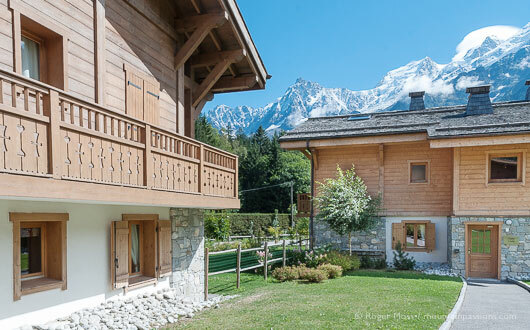 A ‘chalet mitoyen’ is large and divided centrally, allowing two families to share the same structure. The huge facades often incorporated differing decorative touches to denote the boundaries and express the tastes of their occupants. Here again, we notice quite pronounced variation in regional styles, the balustrading in particular ranging from starkly functional to intricately crafted. 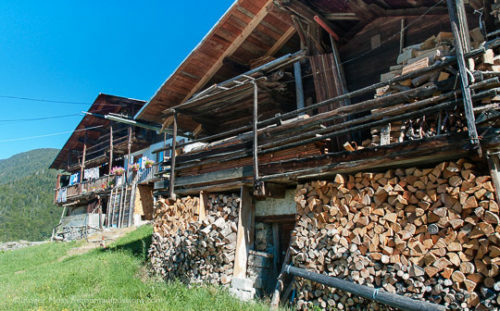 Carefully stacked logs for firewood (‘bois de chauffage’) provide worthwhile extra insulation during extremes of temperature. 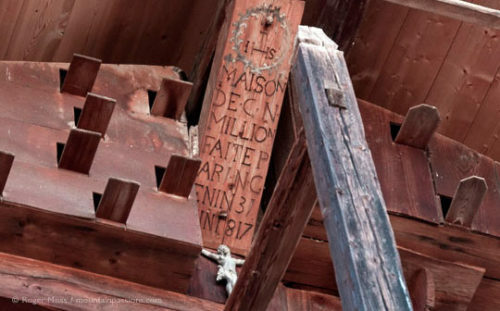 According to tradition, each chalet carries the date of its construction, either on the upper gable roof timber or (as above) incised in a stone lintel. Also commonly displayed are the initials of the original owner. The first floor (‘le fénil’) was destined for human habitation and generally featured a central fireplace with a stone chimney flue plus a full-width balcony used for drying clothes, storing fruit and vegetables, etc., and recessed from the main façade. On steeply-sloping sites the rear of this storey would be at ground level. The second, or upper floor was a well-ventilated ‘grénier’ used for storing hay, timber and other bulky materials requiring rudimentary protection from the elements. The roof incorporated a substantial overhang designed to offer the rest of the structure protection from rain, snow and sun, and featured timber planking protected by various weatherproof coverings. 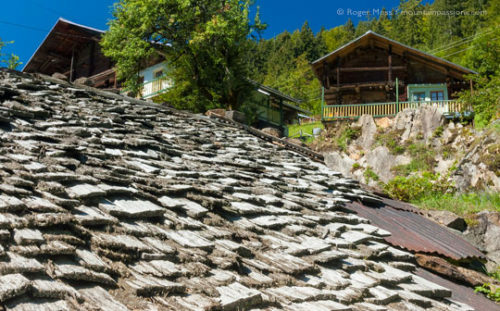 The earliest and most primitive was thatch, or ‘chaume’ which required a steeper roof pitch and was also less able to endure long periods of snow cover. Thatch was therefore superceded by uniformly-sized spruce tiles (known as ‘ancelles’ or ‘tavaillons’, according to their dimensions and often weighted down with large stones), by thick slates (‘ardoise’) or slabs of limestone known as ‘lauze’. The latter materials were often sourced from riverbeds and have a dry weight of at least 150kg per sq m.
A substantial snowfall can add three times this figure to the weight of a lauze roof. By the end of a winter during which the snow has compacted and received further falls, the total is multiplied yet again, placing colossal demands on the supporting roof timbers or ‘charpente’. When springtime returns and the snow melts, the timbers slowly return undamaged to their previous unloaded state. For this reason local épicéa, whose impressive load-bearing abilities continue to increase with age, would be carefully seasoned for many years (sometimes for generations) before it could be considered ready for use in roof construction. 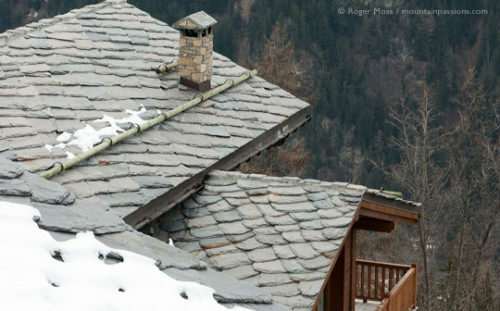 An interesting refinement employing tall stone piers to support the roof overhang was originated in the Haute-Tarentaise and the Aosta Valley. 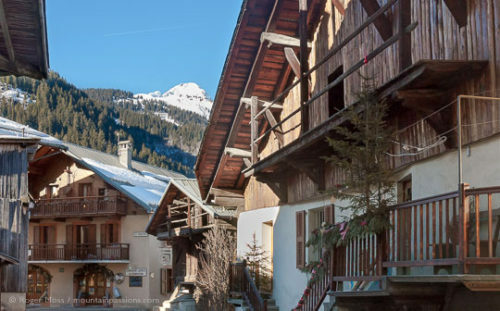 Recently, however, it has been adopted as a stylistic motif by modern developers, most notably in the ski villages of Val d’Isère and Sainte-Foy Tarentaise. Around the time of the First World War corrugated sheeting of galvanised iron began to be used as a cheap and waterproof alternative roof covering, and many examples still survive, often acquiring their own character as the traces of rust begin to appear and stain the panels. Widely emulated, and now coveted by generations of seasonal visitors, the mountain chalet is an enduring design classic which achieves the seemingly impossible: using only instinct, experience and what was available nearby on the mountain, their original constructors succeeded in creating a comfortable and supremely practical home not only for their families, but also for generations of their descendants. 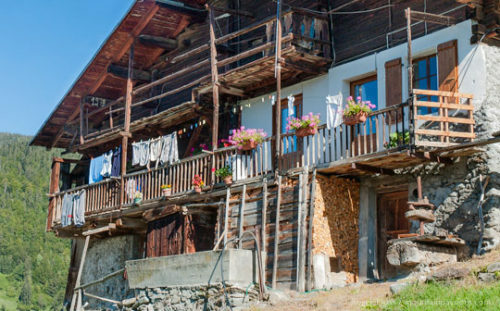 While chalets in some regions display a simple, understated honesty, elsewhere the balustrades of full-width balconies were embellished with the individual decorative touches which have come to define the architecture of the mountains. 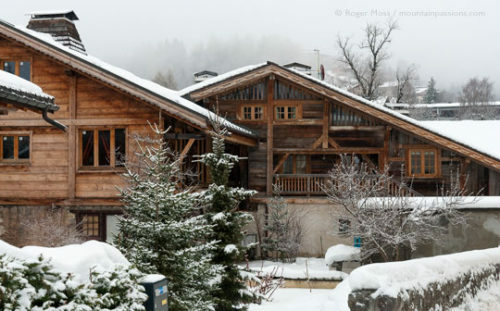 In the French Alps it is common to find a smaller building, termed a ‘mazot’ or ‘grénier’ depending on the region, beside the main chalet. Its purpose was to store a family’s most valuable possessions at a safe distance from any risk of fire originating in the chalet itself. A large, well-protected balcony will often accommodate brightly-painted beehives, or ‘ruches’, adding a convenient supply of honey to the list of summer produce to be stockpiled for the long winter period.